Brian Wall was born in London in 1931, and as a child he experienced the London Blitz during World War II before being evacuated to Yorkshire. Following his return to London after the war, he left school while a teenager to work as a glassblower. After serving as an aerial photographer in the Royal Air Force, he began his artistic career as a painter in the early ‘50s. In 1954 Wall moved to St. Ives, Cornwall, known for its colony of abstract artists including Barbara Hepworth, Ben Nicholson, Patrick Heron, and Terry Frost. Wall worked as assistant to Barbara Hepworth from 1955 to 1960, and constructed wood reliefs and sculptures painted in primary colors. 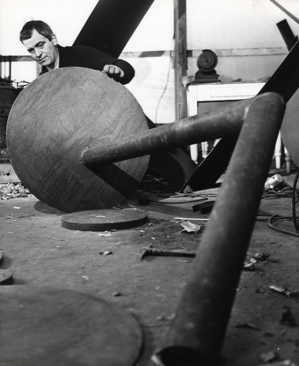 In 1956 he began to make welded steel sculptures, considered among the earliest abstract steel sculptures produced in England. Wall’s first solo show was held in London in 1957 at the Architectural Association, and his work was included in group shows including the Arts Council Exhibition Contemporary British Sculpture in 1958. The first article on his work was published in Architectural Design in 1959. 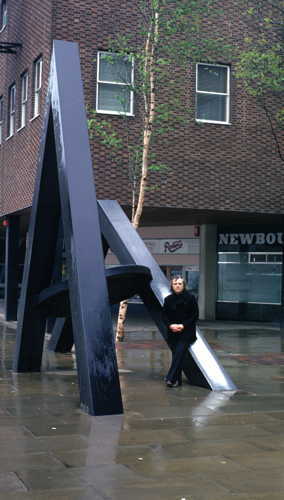 Wall moved back to London in 1960, and became a major figure in the influential English Sculpture of the ‘60s movement. 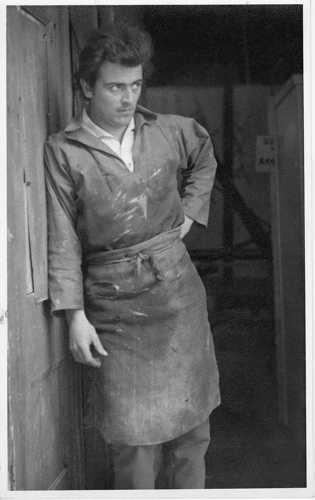 From 1962-1972 he was Head of Sculpture and Principal Lecturer at Central School of Art (now Central Saint Martins) with colleagues including William Turnbull and Barry Flanagan. He served on the National Council for Diplomas in Art and Design and on the Arts Council of Great Britain. In 1961 Wall represented England in the 2nd Paris Biennale, and throughout the decade he exhibited in solo shows in several London galleries as well as major outdoor sculpture exhibitions in Brighton, Bristol, Southampton, Coventry, and Battersea Park, London. His work was included in British Sculpture in the Sixties at the Tate Gallery in 1965, and his monumental sculpture commission for the city of Thornaby, Yorkshire, was the largest sculpture in England when it was installed in 1968. Brian Wall’s work was seen in America for the first time in 1967 in the exhibition New British Painting and Sculpture, which traveled to six U.S. museums including the University Art Museum, Berkeley. Wall visited New York several times in the ‘60s, where he renewed his friendship with American artists he had met in England including Mark Rothko and Barnett Newman and the critic Clement Greenberg. In 1969, Wall was invited to teach at the University of California at Berkeley as a Visiting Professor. He returned to U.C. Berkeley for the 1970-‘71 academic year, and joined the faculty permanently in 1972, becoming a tenured Professor of Art and Chair of the Art Department, retiring in 1994. He became a U.S. citizen in 1982. Wall has continued to exhibit in both England and the United States. A retrospective exhibition was organized by the Seattle Art Museum in 1982 and traveled to the San Francisco Museum of Modern Art with accompanying catalogue. The solo exhibition, Brian Wall: Lyrical Steel, at Sheldon Memorial Art Gallery at the University of Nebraska, Lincoln, was also accompanied by a catalogue. A monograph on Wall’s work written by the Tate curator Chris Stephens was published by Momentum, London in 2006, and in 2015 Brian Wall: Squaring the Circle, edited by art historian Peter Selz, was published in conjunction with a solo exhibition at the de Saisset Museum at Santa Clara University. Wall has had solo exhibitions in New York at Sculpture Now (1977, 1978,) Simon Lowinsky Gallery (1987,1998,) and at Flowers Gallery (2008). He has also exhibited at Flowers gallery in Los Angeles and London, and in San Francisco at Braunstein /Quay Gallery, Jernigan Wicker Fine Arts and at Hackett | Mill. His work is included in public collections including Tate Britain, London; Museum of Art, Dublin; Art Gallery of New South Wales, Sydney; Berkeley Art Museum; Oakland Museum of California; Seattle Art Museum; University of Houston; San Antonio Museum of Art; Santa Clara University and many more. His work is represented by Hackett | Mill, San Francisco. Wall has worked at his Emeryville, California studio since 1975, and continues to construct welded steel sculptures, producing one-of-a-kind pieces himself. He combines geometric elements, often created from sliced sections of industrial steel tubes or I-beams. His pieces range from tabletop scale to monumental outdoor installations, and the surfaces have been waxed, varnished, or painted. He has also produced prints and drawings over the years, recently painting with Sumi ink on Japanese handmade paper. Since 2007 Wall has worked exclusively in stainless steel, constructing curvilinear works from segments of a circle. All sculptures and photographs © Brian Wall. Website content and compilation © Brian Wall Foundation. 2017. Brian Wall Foundation respects the privacy of those accessing its website. The Foundation is taking this opportunity to communicate its privacy and data policies, responsive to the European Union General Data Protection Regulation (GDPR), effective May, 2018.